"Jackson County, on U.S. Highway 59 in the Coastal Prairies region southwest of Houston, borders both Lavaca Bay and Carancahua Bay and is bounded by Calhoun, Victoria, Lavaca, Colorado, Wharton, and Matagorda counties. Edna, the county's largest town, is the county seat. Elevation ranges from sea level to 150 feet. 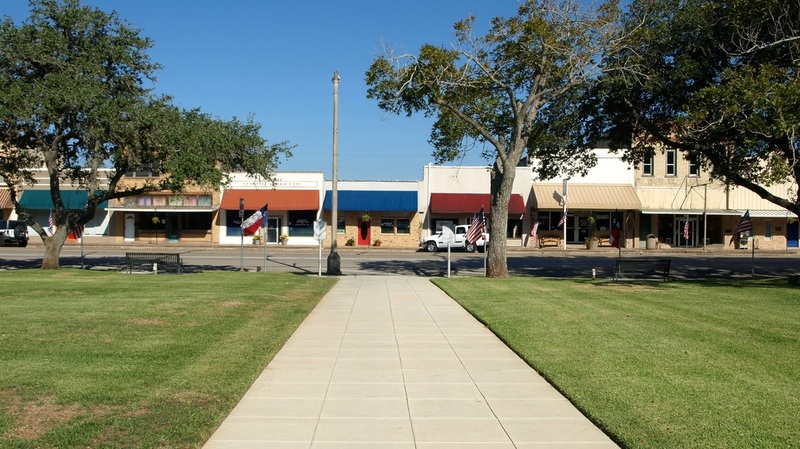 "Jackson County, one of the original counties of Texas, was formed in 1836 from the old Mexican municipality of Jackson. Both the municipality and the county were named after President Andrew Jackson and were settled predominantly by American colonists. Jackson County comprises 844 square miles. With an average annual temperature of 70°, the county has a subtropical, humid climate. 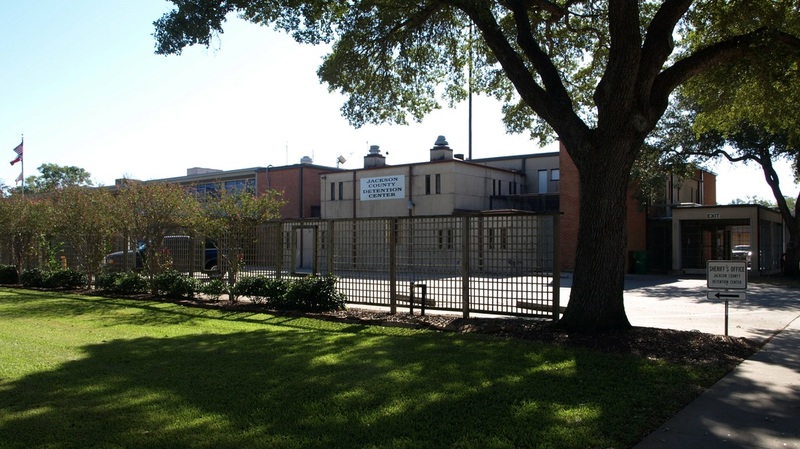 "Six of Stephen F. Austin's Old Three Hundred families settled in the future county. So many of the early colonists came from Alabama that for a time the municipality became known as the "Alabama Settlement." 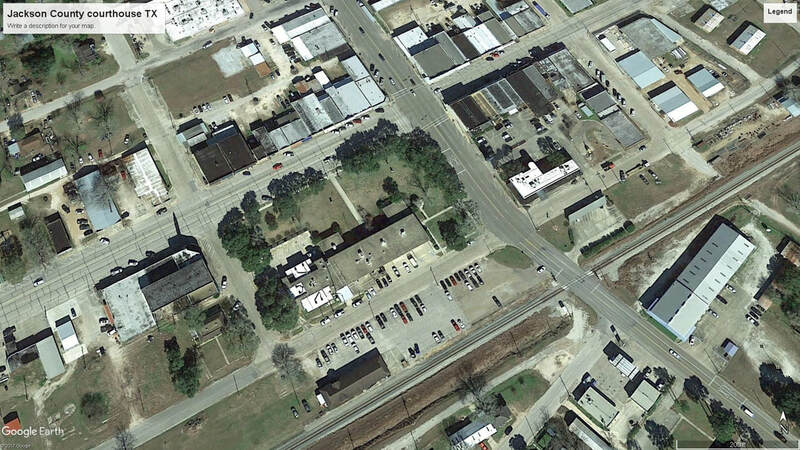 " The old Alabama Settlement continued to grow during the period of the Republic of Texas. In 1836 the municipality was organized into Jackson County. Camp Independence, near Texana, served as campsite and training ground for the Army of the Republic of Texas. 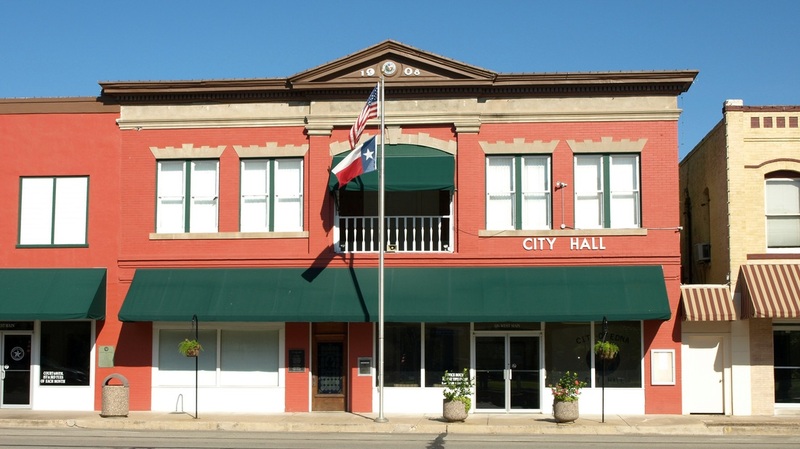 Texana, in addition to being a military post, a port of entry, and an important trading center, was also named the county seat in 1836. 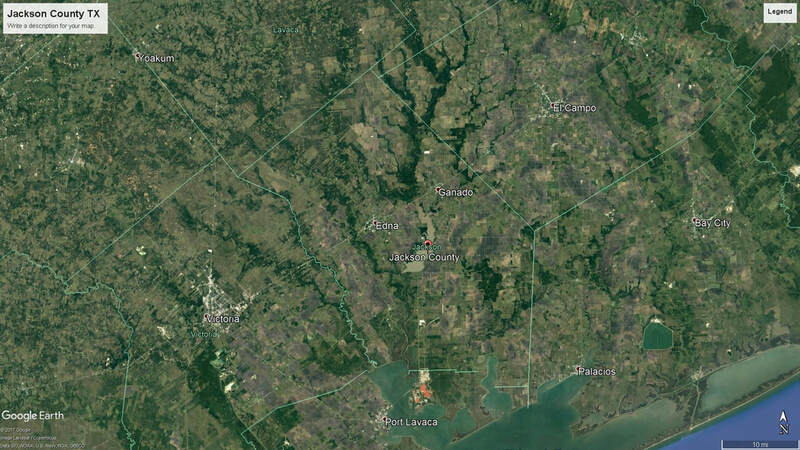 "​In 1844 officials subtracted a narrow strip now in Matagorda and Wharton counties, but added a wedge of what is now Wharton County and a western section between the Lavaca River and Arenosa Creek. Jackson County lost large sections on the north, south, and east to the newly formed Calhoun, Wharton, and Lavaca counties in 1846. The western boundary, however, was extended to Arenosa Creek. 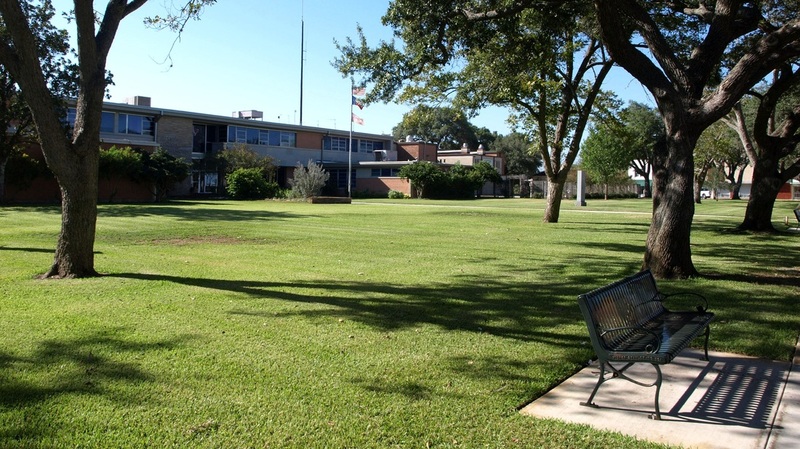 In 1848 more eastern acreage was ceded to Matagorda County. more eastern acreage was ceded to Matagorda County. 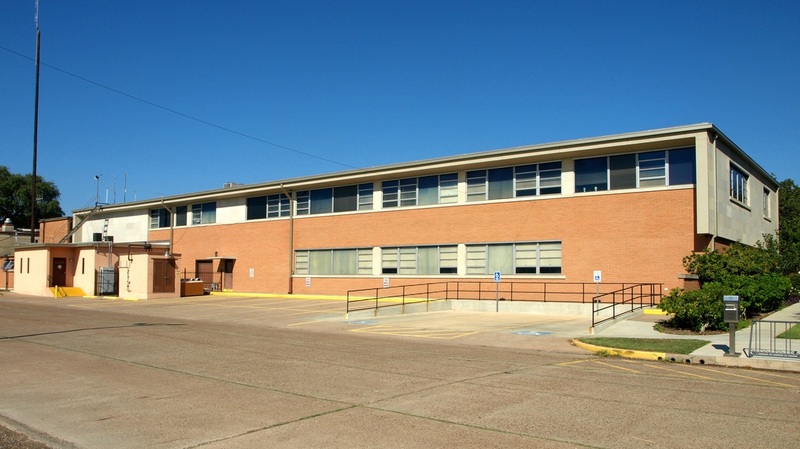 Handbook of Texas Online, Stephen L. Hardin, "Jackson County,"
I visited Jackson County and photographed the courthouse in Edna on August 17, 2009 and on August 15, 2011. With the construction of the New York, Texas and Mexican Railway in the early 1880s the county became an important shipping point for cattle. In 1881 Count Joseph Telfener, representing the railroad, approached the businessmen of Texana [the county seat] for a $30,000 bonus to construct the line through their town. The citizens declined, thinking that a railroad would be detrimental to the existing shipping trade. Telfener therefore selected another route and named one of the main stations on it Edna, after his daughter. A settlement developed around the station, and soon Edna grew into a town. 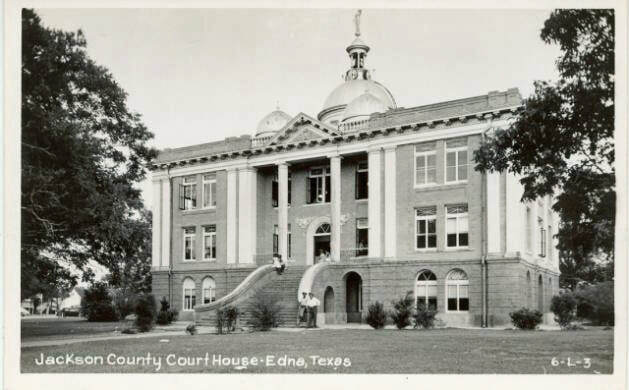 Meanwhile, large numbers of Texana residents moved to Edna; in January 1883 county voters chose by a margin of 272 to 17 to make Edna the county seat. 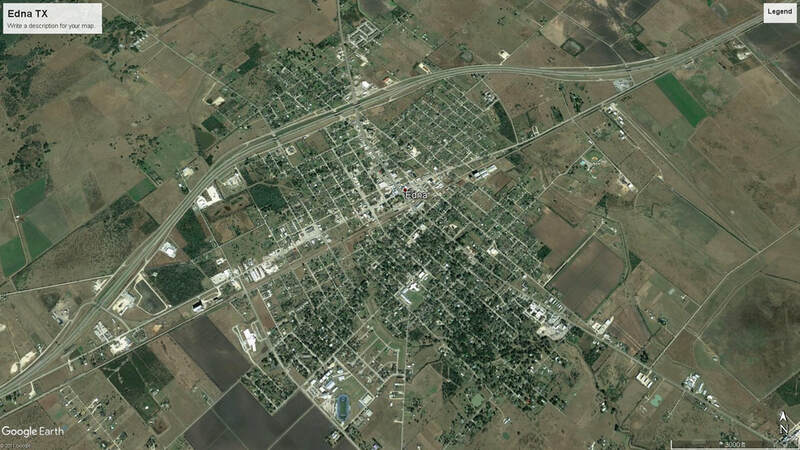 Within two years Texana had become a virtual ghost town. 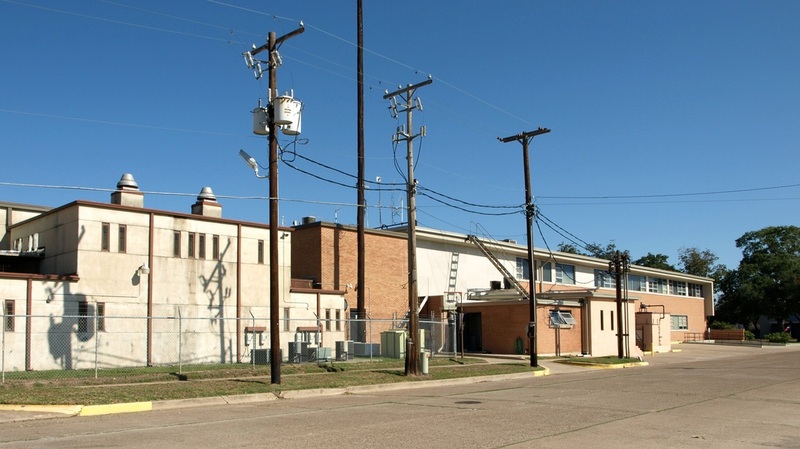 Handbook of Texas Online, Brownson Malsch, "Edna, TX,"
The Edna Police and Fire Department building dates from the 1950's. 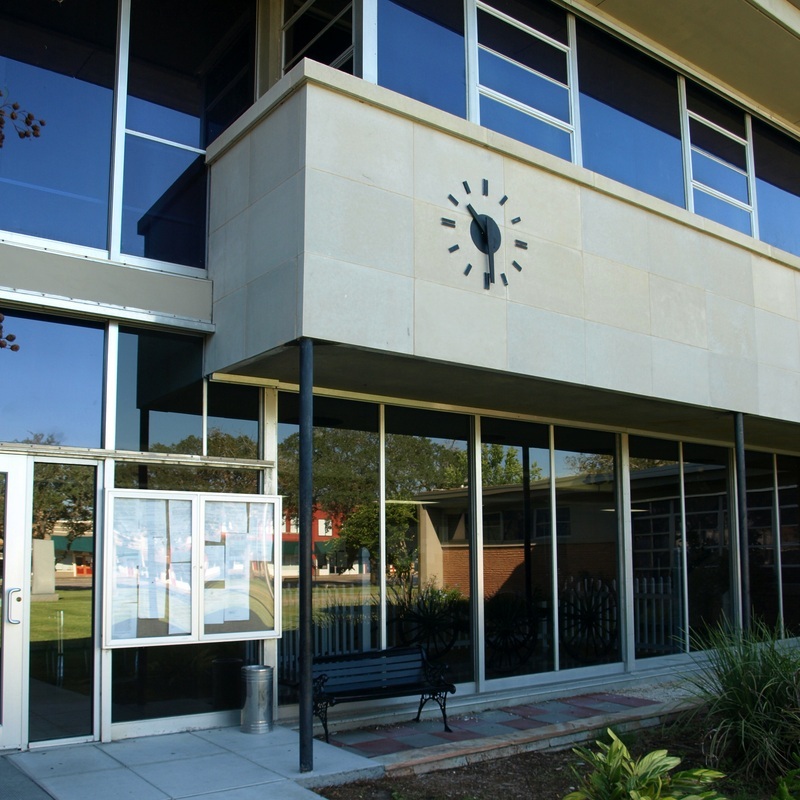 City Hall occupies a 1908 building across from the courthouse. 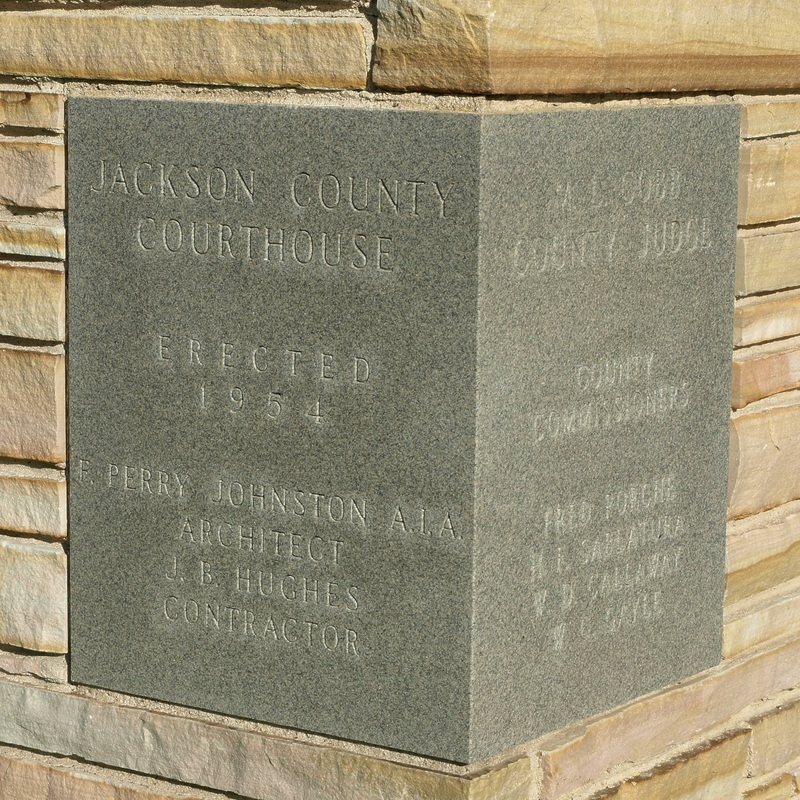 Jackson County courthouse, Charles H. Page, Jr, Architect. Courtesy THC. 1906 courthouse, circa 1939. Photo courtesy TXDOT. 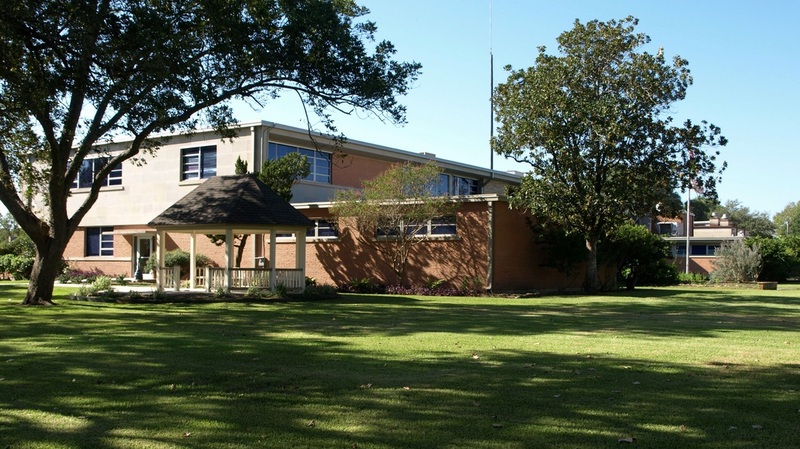 A new courthouse appeared in the early 1950's. Designed by architect F. Perry Johnston of La Marque, Texas, this modern design reflected Johnston's blending of the International Style with influences of Frank Lloyd Wright's Prairie Style. 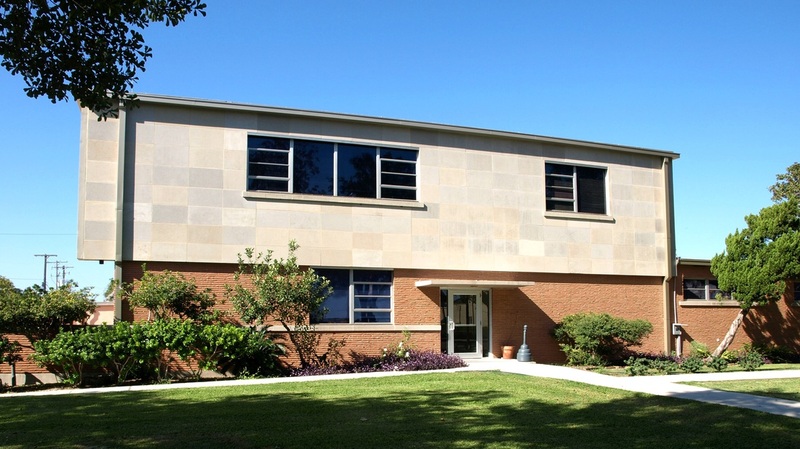 Johnston, designed a number of modern buildings in the Houston area, including the 1939 Josephine Apartments on Bolsover Street in Houston. 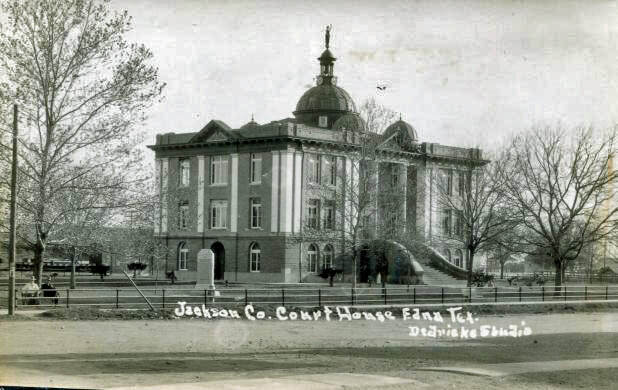 The Jackson County courthouse is in good condition, but has been enlarged with the addition of a jail on the west side. The rooftop mechanical equipment is obviously not original. A steel column has been added to support the cantilevered second floor.